Know the email address of a missing Friend? Click here to contact them! 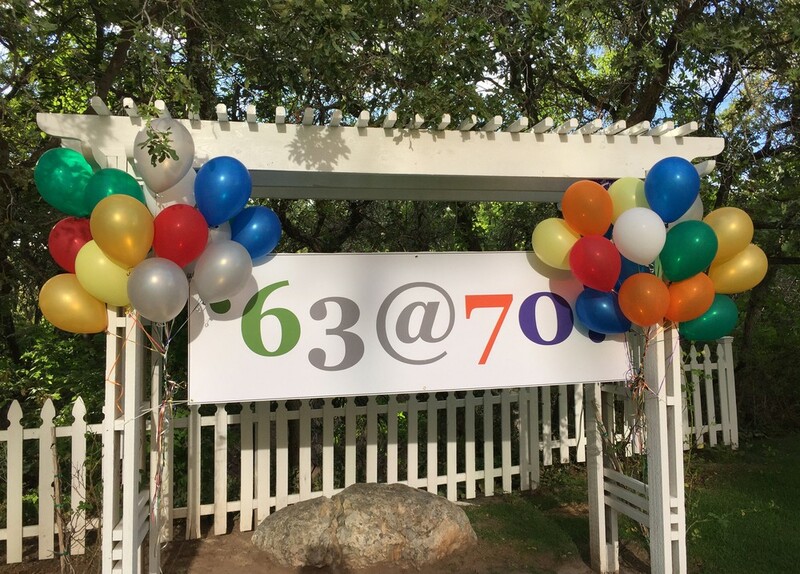 More scenes/memories from our collective 70th Birthday Celebration in 2015 can be found here. 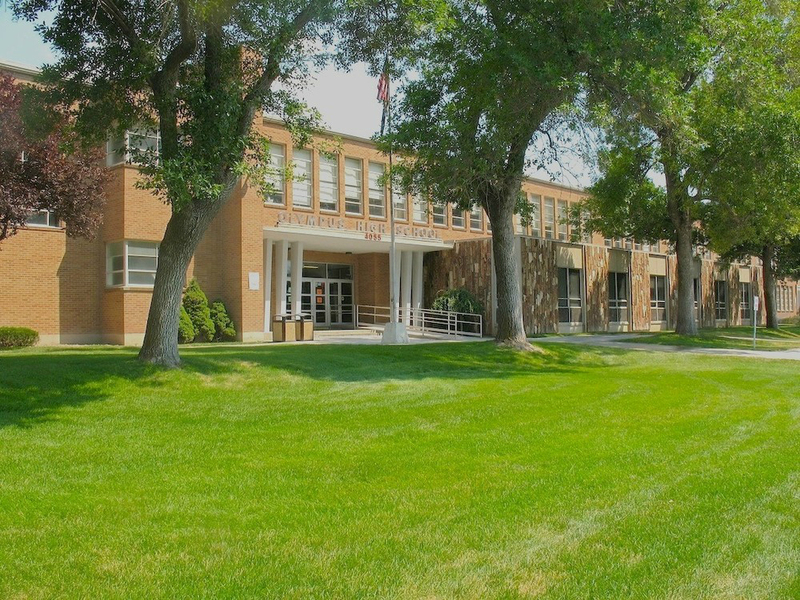 For our collective 75th Birthday celebration (honoring all members of the class, not just those born in 1945) set for Saturday, August 3, 2020, we’re keeping things uncomplicated. We will be gathering at the same location as we did for our 70th -- the gardens of the Marriott University Park Hotel. The fine food fueled a unanimous final decision to organize a collective 75th Birthday fete like we did for collective 70th. In fact, to keep things really simple, we agreed to return to the University Park Marriott’s patio garden and party tent, with quick access to air conditioning should that be necessary. The space has been reserved. Here are a few details. Food: The Marriott has a new chef. They Marriott crew is well aware that there have been a few complaints from us about the quality of food. They have promised fix that this time around, and meet with our Foodies team beforehand to set an appropriate menu etc. Other details will be posted here as they unfold. For now, please save the date: August 3, 2020. And, if you had concerns about food quality in the past, please join the team that will ensure improvements for our collective 75th. So, make plans to join us August 3, 2020, in the gardens and party tent at Marriott University Park in Salt Lake City. Incidentally, while we have not yet established the all-inclusive fee for the evening, we're determined to make affordable for all--in the $30 to $40 range. In a kinder, gentler time the graduating classes of 1963 at Olympus and Skyline High Schools were united as Olympus sophomores in the largest entering high school class (more than 900 strong) ever assembled in Utah. 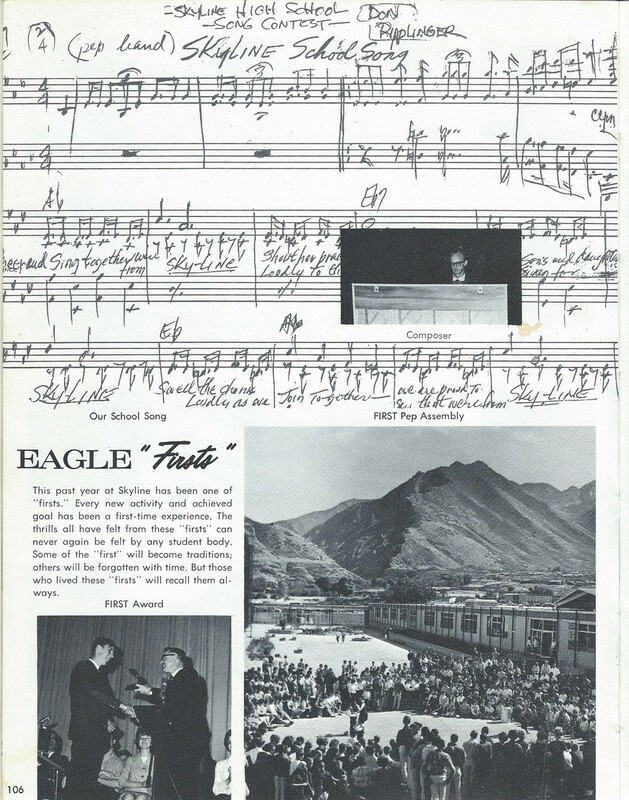 We disassembled somewhat in the Fall of ‘62 when some 200 of us opted to establish new traditions as the members of the first graduating class of the newly-opened Skyline. This is the website everyone who was ever a part of the Class of 1963 at Olympus and Skyline High Schools (www.Oly-Sky63.com). Hundreds of photographs are here. You are encouraged to publish your own photos here on your own pages or in the "Galleries" section where you will find photos from all of the recent reunions as well as of our days together way back when. Before the old Olympus returned to the dust from whence it came, John Telford and Paul Bjorn photographed the old school (it looked pretty spiffy actually). They too are posted to this site under "Galleries." Incidentally, if you see a camera icon next to a classmate’s name on the roster, it indicates he/she has posted photographs. Just click on the “name” and all the pictures that person posted will appear. The bottom line is this: if you haven’t visited the main Olympus and Skyline site and devoted at least 45 minutes to checking-out your friends and add your own personal reflections, you are missing out. Spend some time here. If you know the email addresses of classmates who have not yet subscribed to the site, be sure to invite them using the invitation box in the bottom right-hand corner of this page. Simply paste or type in our missing classmate's email address. The system will take care of the rest. In 2003, 2008, 2013 and every year since many class members contributed far more than the required participation fees. Thank you to them. Donations over and above standard reunion fees have been used to underwrite the general costs of the reunion and thereby ensuring that individual fees are affordable to all. This proud tradition is being sustained in the run-up to our 55th Reunion August 10-11, 2018 in Salt Lake City. The list of classmates who have contributed to the general reunion fund can be found here: http://www.oly-sky63.com/class_custom4.cfm. Please donate whatever you can, whenever you can, to help keep our class events affordable to all.